Location: Potomac River Basin, All of navigable Potomac River from Westernport, WV, downstream to Chesapeake Bay. The Potomac River Water Trail (PRWT) is, simultaneously, a relic of the past 9,000 years and an evolving feature of the present. As long as people have lived in the Potomac River valley, the River and its banks have been used for transportation, recreation, and livelihood. More recently, the concept of a modern water trail has been embraced by Maryland, Virginia, West Virginia, and the District of Columbia as well as the Chesapeake Bay Program and the National Park Service Chesapeake Bay Gateways Network. 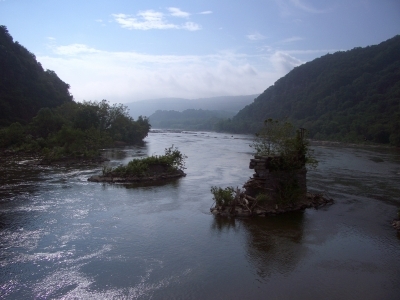 PRWT follows the navigable portions of the Potomac River from high in the Appalachian Mountains to the Chesapeake Bay. The trail traverses over 300 miles and its creation is a result of cooperation and the desire to highlight and preserve a regional and national treasure. The trail offers exciting opportunities to experience the varied landscapes and rich history of the Potomac River. The River transects four distinct physiographic provinces, each associated with the development of our nation and each shaped by the interaction of climate, topography, geology, flora and fauna and human activities. Our heritage is a product of these landscapes, reflecting patterns of human activity shaped by geography, both through the physical features that remain and the traditions that have evolved in them. Across North America, the concept of water trails is becoming more popular in our region. The PRWT offers experiences from short trips to enjoy the sights and sounds of the River to prolonged excursions to explore a natural or historical theme in depth. Some choose to combine boating with other outdoor pursuits; land trails offer numerous opportunities to complement paddling and sailing excursions with bicycling, hiking, and outdoor education. The trail is used by the Alexandria Seaport Foundation to provide experiences for at-risk youth, by the Alliance for the Chesapeake Bay and Interstate Commission for the Potomac River Sojourn (including scholarships for youth), by Boy Scouts and Girls Scouts, and many others. The River Sojourn and projects by the Interstate Commission and Potomac Conservancy coordinate management activities. White Horse Rapid. Photo by Mary Shaw.